Criminal defense? Brain scans could show whether “they did it on purpose??? Home/The Jury Room (Keene Trial Consulting)/Criminal defense? 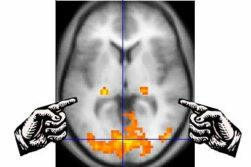 Brain scans could show whether “they did it on purpose??? Your goal is to light the fire of moral indignation in the minds of the jurors. You want to answer both aspects of the common juror refrain “it may be legal but it sure isn’t right”. Show them it isn’t right. Show them it isn’t legal. Give them facts to buttress their feelings in deliberations. It is research we often consider when we hear that common refrain from our mock jurors—“it may be legal but it sure isn’t right”. But this is eight years later and technology has advanced to the point that we now have research telling us a brain scan can tell us whether someone was acting “knowingly” as opposed to “recklessly”. We are grateful the researchers point out that their technique “represents a proof of concept, and not yet a usable tool”. Nevertheless, expect to hear this one coming to a courtroom before too long (much like the other neurolaw defenses we’ve covered here before). Here’s what they did. The researchers used “neuroimaging and machine-learning techniques” (aka fMRI) to display varying brain activities related to whether the defendant “knew he was carrying drugs” or “merely aware of a risk that he was”. They clarify this question of “criminal intent” is what criminal juries must determine—in other words, was the defendant’s behavior “knowing” or was it “reckless”? While there have been studies using fMRIs before this one, the authors say there are “no fMRI studies [snip] that have attempted to determine whether and how the ‘culpable mental states’ map onto differential activations in the human brain”. In other words, if you know you are behaving illegally do different parts of your brain “light up” as compared to when you are aware you might be acting illegally but proceed recklessly. So, fMRIs are expensive but the researchers did 40 of them (20 men and 20 women). Half the participants were told they were carrying a suitcase containing contraband (the “knowing” condition) and half were told their suitcase might have contraband in it (the “reckless condition”). After that introduction, into the fMRI machines they went. Those in the knowing condition (who knew they were carrying contraband) were more likely to “light up” in the anterior insula (said by the authors to be involved in the assessment of risk and uncertainty) and the dorsomedia area of the prefrontal cortex (said by the authors to be involved in assessing probabilities) of the brain. Those in the reckless condition were more likely to “light up” the occipital cortex (said by the authors to reflect higher uncertainty). The researchers comment on the small sample size and other issues with their study that preclude generalizability. For this show of reticence and respect for statistical realities we are grateful. The reality is that, no matter what areas of the brain light up, we can’t know if that shows the difference between “knowing” and “reckless” or if it is simply a response to risk level. Not to mention, these were imagined behaviors and not real ones. Our mock jurors have been very suspicious of neurolaw findings and whether you can “prove” they mean what the researchers say they mean. Neurolaw developments remain a very interesting but “not ready for prime time” area of research, or perhaps better said, “not ready for a Daubert challenge”. If you are interested in knowing more about neurolaw, here’s a review of the book Law and Neuroscience.